Three pages in to Skippy Dies, Skippy does just that--he dies. This is no spoiler, for it is both the title and the premise of Paul Murray's astoundingly beautiful novel about an Irish prep school. We, along with Skippy's friends, teachers, and family, are left wondering, "Why did Skippy die?" The answer to that question makes up the first part of Skippy Dies, as we take a deep dive into the life of Skippy, an awkward, nerdy middle-schooler with a deep-seated love of video games, a roommate trying to contact aliens, a collection of teachers who don't understand him and a family situation that leaves much to be desired. When he falls in love with a girl far outside his reach, the boundaries of his normal life stretch beyond his wildest dreams, until it feels almost inevitable that they must burst. Caught up in this story are a host of rather unlikeable characters: the spineless history teacher who cannot decide what he stands for, the egotistical principal, the stereotypical campus drug dealer. But their unlikeability is also their charm, for we can see in each of these characters, and in Skippy, too, a glimpse of ourselves or of those we have known in our own lives. "So why don't they? It's not that Howard doesn't love her. He does, he would do anything for her, lay down his life if it came to it - if for example she were a princess menaced by a fire-breathing dragon, and he a knight on horseback, he would charge in with his lance without a second thought, stare the serpent right in its smouldering igneous eye, even if it meant getting barbecued there on the spot. But the fact is - the fact is that they live in a world of facts, one of which is that there are no dragons; there are only the pale torpid days, stringing by one like another, a clouded necklace of imitation pearls, and a love binding him to a life he never actually chose." His crisis--that he has fallen into his own life and cannot seem to find a way out--is a near-perfect foil to the insecurities of the students we come to know, as they look out on the big, wide world and see in it nothing but possibility, endless possibility. For some (such as Skippy), this possibility is crushing, daunting, and overwhelming, but for his overweight, overwraught roommate, this possibility means that humans can contact aliens using the undefined m-theory and save the world from ultimate obliteration. "Life makes fools of us all sooner or later," says one of the teachers. "But keep your sense of humour and you'll at least be able to take your humiliations with some measure of grace. In the end, you know, it's our own expectations that crush us." This lesson is only further emphasized by the wit and humour Murray folds into each layer of his story, though I often found myself so caught up in the melancholy that it was not until I finished reading that I realized the hilarity of it all: the boys in foil hats attempting to contact aliens, the girls in slutty Halloween costumes at the mixer, the obscene, glowing donut-shaped sign that advertises Ed's, the local hangout. 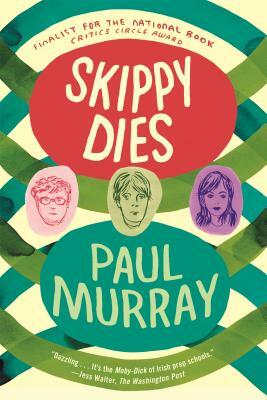 There is no shortage of praise I could heap upon Skippy Dies, despite the occasional slow-going bits in the middle. For sanity's sake, I will limit my own ramblings, and caution you to look out for this one if you have not already read it--expecting something weird and poetic and physical and philosophical and ultimately important when you do. I liked what I read of that book, but I couldn't finish 700+ pages in the 3 weeks I had it on loan from the library! I might go back to it though, it was good. I'd say it is definitely worth going back to! It is a little slow in the middle, but picks up in the second half, so hopefully the second 350 pages go faster for you (in time for library loans, at least).